Our amulets use Thailand gold. 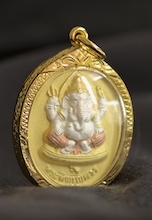 Here is a little information about how gold is typically used in amulets from Thailand. Thailand is well-known and highly regarded for gold jewelry and Buddhist amulets and other items. Gold is the ultimate material for looks… and yet, when it is very pure (Thai Baht gold which is 96.5% pure) the gold is too soft and dings, scratches, and disfigures easily. For this reason, usually 14K and 18K gold plating is used in Thai amulets and necklaces that will be worn often. The amulets we have here are, without exception, gold plated and gold dipped. I don’t think we have any pure gold items at all here – and you wouldn’t find such a thing in a Buddhist temple in Thailand either – pure gold items are found in jewelry stores. There are amulets which are made by / for jewelry stores, and there are amulets that are made at / for the thousands of Buddhist temples in Thailand. We sell only original Buddhist amulets and items we bought directly from the temples themselves… never from a jewelry store. In this way, we are 100% sure to buy and sell only authentic items to you. Many people appreciate this, and we have long lists of customers that come back to buy more items as time passes. One thing you will notice about Thai gold amulets, and all amulets is that those that were made at the temples – are usually not flawless, in the western sense of the word. Monks are not jewelers, they are craftsmen. They try very hard to make the items as high quality as possible, but, if monks made them – you can probably find very small imperfections in the amulets. This occurs with most items found at the temple. Thais do not degrade the amulet when these micro-sized imperfections are found, they are part of the process. If you want picture-perfect amulets to give as a gift – you can choose those made at a jewelery shop. They are not authentic, they are not Buddhist… they are like something you would find in a gold magazine in your own country – just in the shape of a Buddha. They are likely not blessed at the temple, and even if they were – you’d own a perfect looking Buddha amulet that was not made at a temple, and yet blessed at at temple. It’s a bit of a strange thing to consider for Thais in Thailand, to wear items like this.. Most Thais prefer to buy their Buddhist items from Buddhist monks and nuns (magee) at the temples in Thailand. We sure do too. Thai gold is sold in different weight units than you might be used to. Thais call 15.16 grams of pure gold – 1 Thai Baht. Baht gold is nearly 1/2 Troy ounce of pure gold – which weights 31.1 grams. We don’t sell any pure gold items here at ThaiAmuletSales.com, nor do we know anyone that deals in gold. If it is pure gold amulets or cases that you wish to find, please consult jewelry stores in your local area. They may know a source for you. We have been selling items at ThaiAmuletSales.com for more than four years now. We have had only 2 customers contact us to tell us their item was discolored. If your items turns black or some horrible color – please contact us. It just doesn’t make sense… and we may choose to replace the item, or not. If you swim in the salt water ocean, please note that your amulet will likely turn a very dark color in a short time. Most of the gold plated cases we sell are not waterproof and they will discolor easily upon exposure to water – especially salt water. 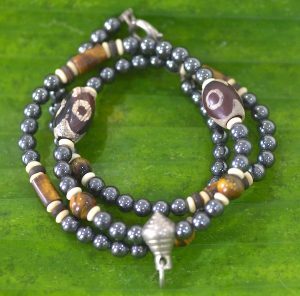 For more detailed information about Thailand Amulets, please look at your leisure through our online amulet, necklace, bracelet, and other items here on this site. Please also feel free to contact us by email or chat, if you have any questions that are not answered and we will gladly respond to your inquiry.